Cantonese opera (Chinese: 粵劇) is one of the major categories in Chinese opera, originating in southern China's Guangdong Province. It is popular in Guangdong, Guangxi, Hong Kong, Macau and among Chinese communities in Southeast Asia. Like all versions of Chinese opera, it is a traditional Chinese art form, involving music, singing, martial arts, acrobatics, and acting. There is debate about the origins of Cantonese opera, but it is generally accepted that opera was brought from the northern part of China and slowly migrated to the southern province of Guangdong in the late 13th century, during the late Southern Song dynasty. In the 12th century, there was a theatrical form called the Nanxi or "Southern drama", which was performed in public theatres of Hangzhou, then capital of the Southern Song. With the invasion of the Mongol army, Emperor Gong of the Song dynasty fled with hundreds of thousands of Song people into Guangdong in 1276. Among them were Nanxi performers from Zhejiang, who brought Nanxi into Guangdong and helped develop the opera traditions in the south. Many well-known operas performed today, such as Tai Nui Fa originated in the Ming Dynasty and The Purple Hairpin originated in the Yuan Dynasty, with lyrics and scripts in Cantonese. Until the 20th century all the female roles were performed by males. Beginning in the 1950s immigrants fled Shanghai to areas such as North Point. Their arrival significantly boosted the Cantonese opera fan-base. Also, the Chinese Government wanted to deliver the message of socialist revolution to Chinese people under colonial governance in Hong Kong. Agents of the Chinese government founded newspaper platforms, such as Ta Kung Pao (大公報) and Chang Cheung Hua Pao (長城畫報) to promote Cantonese Opera to the Hong Kong audience. These new platforms were used to promote new Cantonese Opera releases. This helped to boost the popularity of Cantonese Opera among the Hong Kong audience. Gradually, Cantonese Opera became a part of daily entertainment activity in the colony. The popularity of a Cantonese Opera continued to grow during the 1960s. More theatres were established in Sheung Wan and Sai Wan, which became important entertainment districts. Later, performances began to be held in playgrounds, which provided more opportunities to develop Cantonese Opera in Hong Kong. As the variety of venues grew, so the variety of audiences became wider. However, Cantonese Opera began to decline as TV and cinema started to develop in the late 1960s. Compared to Cantonese Opera, cinema was cheaper and TV was more convenient. Subsequently, some theatres started to be repurposed as commercial or residential buildings. The resulting decline in available theatres further contributed to the decline of Cantonese Opera in the territory. Since the demolition of Lee Theatre and the closing down of many stages (Tai Ping Theatre, Ko Shing Theatre, Paladium Theatre, Astor Theatre or former Po Hing Theatre, Kai Tak Amusement Park and Lai Chi Kok Amusement Park) that were dedicated to Cantonese genre throughout the decades, Hong Kong's Sunbeam Theatre is one of the last facilities that is still standing to exhibit Cantonese Opera. By early 1980s, Leung Hon-wai was one of the first in his generation of the Chinese Artists Association of Hong Kong (hkbarwo) who gave classes and actively engaged in talent-hunting. The Cantonese Opera Academy of Hong Kong classes started in 1980. To intensify education in Cantonese opera, they started to run an evening part-time certificate course in Cantonese Opera training with assistance from The Hong Kong Academy for Performing Arts in 1998. In 1999, the Association and the Academy further conducted a two-year daytime diploma programme in performing arts in Cantonese Opera in order to train professional actors and actresses. Aiming at further raising the students' level, the Association and the Academy launched an advanced course in Cantonese opera in the next academic year. In recent years, the Hong Kong Arts Development Council has given grants to the Love and Faith Cantonese Opera Laboratory to conduct Cantonese opera classes for children and young people. The Leisure and Cultural Services Department has also funded the International Association of Theatre Critics (Hong Kong Branch) to implement the "Cultural Envoy Scheme for Cantonese Opera" for promoting traditional Chinese productions in the community. Also, the Hong Kong Government planned to promote Cantonese Opera through different communication channels. They wanted to build more theatres for the Hong Kong public to have more opportunities to enjoy Cantonese Opera. The scheme also arrived to develope professional talents in Cantonese Opera. Cantonese Opera became a part of the compulsory Music subject in primary school. For teachers, the Education Bureau provided some training and teaching materials related to Cantonese Opera. To continue the tradition by passing on what elders and veterans inherited from former generations and to improve sustainability with new and original music, lyrics and scripts. Heritage is as abstract a concept as traditions is while monetary support is real. However, elders are not ombudspersons in any sense and they take public funds for their own reasons. That is, they are knee deep in commercial performances even as a member of the above organizations. A juren a century ago can be an adjunct associate professor now in Hong Kong. How business was conducted in a community by a juren was illustrated by Ma Sze Tsang in a film called the Big Thunderstorm (1954). The Art of Fong Yim-fun Sustainability Project, Shaw College, CUHK. In August 2014, the Fong Yim Fun Art Gallery was formally opened. Dr. Yang Leung Yin-fong Katie, the Honorary Life Chairman, donated one of her properties to be the permanent office of the Chinese Artists Association of Hong Kong to provide residences for aged musicians. In 2019, Yuen Siu Fai said that old performers are to stay front and center on stage as long as they want to take center stage instead of sharing, let alone ceding, the limelight to the next or even younger generations. Yuen insists that performers without bags under their eyes could not be any good. In 2018, Law Kar Ying said Chan Kam Tong had already jumped the shark in the mid-1950s, more than ten years before Chan actually left the stage or more than 60 years for it to be confirmed to the public. Two performers Chan worked with closely, who definitely left the stage at will with dignity, are Yam Kim Fai and Fong Yim Fun. Cantonese opera shares many common characteristics with other Chinese theatre genres. Commentators often take pride in the idea that all Chinese theatre styles are similar but with minor variations on the pan-Chinese music-theatre tradition and the basic features or principles are consistent from one local performance form to another. Thus, music, singing, martial arts, acrobatics and acting are all featured in Cantonese opera. Most of the plots are based on Chinese history and famous Chinese classics and myths. Also, the culture and philosophies of the Chinese people can be seen in the plays. Virtues (like loyalty, love, patriotism and faithfulness) are often reflected by the operas. Cing sik sing (程式性; Jyutping: cing4 sik1 sing3) – formulaic, formalised. Heoi ji sing (虛擬性; Jyutping: heoi1 ji5 sing3) – abstraction of reality, distancing from reality. Sin ming sing (鮮明性; Jyutping: sin1 ming4 sing3) – clear-cut, distinct, unambiguous, well-defined. Zung hap ngai seot jing sik (綜合藝術形式; Jyutping: zung3 hap6 ngai6 seot6 jing4 sik1) – a composite or synthetic art form. Sei gung ng faat (四功五法; Pinyin: sì gōng wǔ fǎ, Jyutping: sei3 gung1 ng5 faat3) – the four skills and the five methods. The four skills and five methods are a simple codification of training areas that theatre performers must master and a metaphor for the most well-rounded and thoroughly-trained performers. The four skills apply to the whole spectrum of vocal and dramatic training: singing, acting/movements, speech delivery, and martial/gymnastic skills; while the five methods are categories of techniques associated with specific body parts: hands, eyes, body, hair, and feet/walking techniques. The acting, acrobat, music and singing, live on stage, are well-known as essential characteristics of live performances in theaters. Recordings did not replace human voice backstage behind the prop only when choir members were actually introduced to the audience at curtain call. Before widespread formal education, Cantonese opera taught morals and messages to its audiences rather than being solely entertainment. The government used theatre to promote the idea of be loyal to the emperor and love the country (忠君愛國). Thus, the government examined the theatre frequently and would ban any theatre if a harmful message was conveyed or considered. The research conducted by Lo showed that Cantonese Operatic Singing also relates older people to a sense of collectivism, thereby contributing to the maintenance of interpersonal relationships and promoting successful ageing. (Lo, 2014). Young people construct the rituals of learning Cantonese opera as an important context for their personal development. Cantonese opera is a kind of Operas of Deities. Operas for Deities are often performed in celebration of folk festivals, birthdays of deities, establishments or renovations of altars and temples. A community organises a performance of opera, which is used to celebrate the birth of the gods or to cooperate with the martial arts activities, such as "Entertaining People and Entertaining God" and "God and People". These performances can be called " Operas for Deities ". This king of acting originated from the Ming Dynasty and the Qing Dynasty. It was also called the scared drama in the performance of God's birthday. It is a meritorious deed for God. According to the study, most of the Cantonese operas in Hong Kong belong to the Operas for Deities, and the nature of the preparations of the "God Circus" can be broadly divided into three categories: the celebration of the gods, the Hungry Ghost Festival, the Taiping Qing Dynasty, the temple opening and the traditional festival celebrations. In the 1960s -1970s, the Chinese opera was at a low ebb. However, due to the support of Opera for Deities, some of the troupes can be continue to perform. In the 1990s, the total performance rate of Operas for Deities has been reduced from two-thirds to two-fifths in the 1980s, there is no such thing as a performance in the Cantonese opera industry. There are two types of Cantonese opera plays: Mou (武, "martial arts") and Man (文, "highly educated", esp. in poetry and culture). Mou plays emphasize war, the characters usually being generals or warriors. These works contain action scenes and involve a lot of weaponry and armour. Man plays tend to be gentler and more elegant. Scholars are the main characters in these plays. Water sleeves are used extensively in man plays to produce movements reflecting the elegance and tenderness of the characters; all female characters wear them. In man plays, characters put a lot of effort into creating distinctive facial expressions and gestures to express their underlying emotions. There are four types of roles: Sang (Sheng), Daan (Dan), Zing (Jing), and Cau (Chou). Siu2 Sang1 (小生) – Literally, young gentleman, this role is known as a young scholar. Mou5 Sang1 (武生) – Male warrior role. Siu2 Mou5 Sang1 (小武生) – Young Warrior (usually not lead actor but a more acrobatic role). Man4 Mou5 Sang1 (文武生) – Literally, civilized martial man, this role is known as a clean-shaven scholar-warrior. Actresses for close to a century, of three generations and with huge successes worldwide, usually perform this male role are Yam Kim Fai (mentor and first generation), Loong Kim Sang (protégée and second generation), Koi Ming Fai and Lau Wai Ming (the two youngest listed below both by age and by experience). Lou5 Sang1 (老生) – Old man role. Faa1 Daan2 (花旦) – Literally 'flower' of the ball, this role is known as a young belle. Yi6 Faa1 Daan2 (二花旦) – Literally, second flower, this role is known as a supporting female. Mou5 Daan2 (武旦) – Female warrior role. Dou1 Maa5 Daan2 (刀馬旦) – Young woman warrior role. Gwai1 Mun4 Daan2 (閨門旦) – Virtuous lady role. Lou5 Daan2 (老旦) – Old woman role. Man4 Zing2 (文淨) – Painted-face character that emphasizes singing. Mou5 Zing2 (武淨) – Painted-face character that emphasizes martial arts. Zhang Fei (張飛; Zœng1 Fei1) and Wei Yan (魏延; Ngai6 Jin4) from Three Humiliations of Zhou Yu (三氣周瑜; Saam1 Hei3 Zau1 Jyu4). Xiang Yu (項羽; Hong6 Jyu5) from The Hegemon-King Bids His Concubine Farewell (霸王別姬; Baa3 Wong4 Bit6 Gei1). Sun Wukong (孫悟空; Syun1 Ng6 Hung1) and Sha Wujing (沙悟凈; Saa1 Ng6 Zing6) from Journey to the West (西遊記; Sai1 Jau4 Gei3). Cau2 Sang1 (丑生) – Male clown. Cau2 Daan2 (丑旦) – Female clown. Man4 Cau2 (文丑) – Clownish civilized male. Coi2 Daan2 (彩旦) – Older female clown. Mou5 Cau2 (武丑) – Acrobatic comedic role. Applying makeup for Cantonese opera is a long and specialized process. One of the most common styles is the "white and red face": an application of white foundation and a red color around the eyes that fades down to the bottom of cheeks. The eyebrows are black and sometimes elongated. Usually, female characters have thinner eyebrows than males. There is black makeup around the eyes with a shape similar to the eyes of a Chinese phoenix (鳳眼; fung6 ngaan5). Lipstick is usually bright red (口唇膏; hau2 seon4 gou1). A female-role actress is in the processes of applying her markup: spreading a creamy. foundation on her cheeks and forehead; putting blusher on her cheeks, eyelids and both sides of the nose; darling her eyebrows and drawing eye-lines and eye-shadows; pasting hairpieces around her face to create an oval-shaped look; lipstick has been put on prior to this; placing hairpins on the hairpiece. Actors are given temporary facelifts by holding the skin up with a ribbon on the back of the head. This lifts the corners of the eyes, producing an authoritative look. Each role has its own style of make-up: the clown has a large white spot in the middle of his face, for example. A sick character has a thin red line pointing upwards in between his eyebrows. Aggressive and frustrated character roles often have an arrow shape fading into the forehead in between the eyebrows (英雄脂; jing1 hung4 zi1). Strong male characters wear "open face" (開面; hoi1 min4) makeup. Each character's makeup has its own distinct characteristics, with symbolic patterns and coloration. Costumes correspond to the theme of the play and indicate the character of each role. As mentioned above, each type of play is associated with particular costumes. The water sleeves of man (文) plays can be attached to the waist or the sides of the breast areas. Costumes can be single or double breasted. Costumes also indicate the status of the character. Lower-status characters, such as females, wear less elaborate dresses, while those of higher rank have more decorative costumes. Major Career Artists (大老倌) listed above, playing the six main characters (generic combination of 2 Sang, 2 Daan, Zing, and Cau), are always supposed to pay for their own costumes. Over time, they build a fortune ($millions) by spending most of their income on good quality, such as Sequin (珠片), costumes for each and every performance. Their collections, measured in number of Chest (furniture) , of such costumes, the quantity, reflect their status as professional performers (大老倌). Those chests are only sold when they retire or passed for free onto appointed successors. To career artists, Sequin (珠片) costumes are essential for, the main source of income, their commercial, festive performances at various Bamboo Theatres (神功戲) for decades in Hong Kong. These costumes passed from generation to generation of, famous and successful, career performers (大老倌) are priceless, according to some art collectors. With the developments and changes of time, the materials used for the costumes had a diverse change. From 50's - 60's, Sequin (珠片) is the most famous materials used for designing the costumes. Nowadays, designers tends to use rhinestones (人造閃石) or Foil Fabric (閃布) to replace Sequin (珠片) . To compare with Sequin (珠片), rhinestones (人造閃石) and Foil Fabric (閃布) are more lighter than Sequin (珠片). However, the older generation remains using Sequin (珠片) and they think Sequin (珠片) is more shining and eye-catching in the stage. Most of the costumes in Cantonese Opera is come from traditional design. Some of the people find that the design didn’t change, because most of the designer is apprenticeship (師徒制). Hence, most of the mentees using the same way to design the costume. In Cantonese Opera industry, some of the designer is inherited from their family about the traditional Cantonese Opera industry. Therefore, they have a basic knowledge and experience for making costumes for Cantonese Opera. In 1973, Yam Kim Fai gave Loong Kim Sang, her protégée, the complete set of Sequin (珠片) costumes needed for career debut leading her own commercial performance at Chinese New Year Bamboo Theatre. For those not to be used anymore, antiques as well as those of famous artists, Lam Kar Sing and Ng Kwun-Lai, are also on loan or donation to the Hong Kong Heritage Museum regularly. A Cantonese opera exhibit at the Hong Kong Museum of History, 2008. Hats and helmets signify social status, age and capability: scholars and officials wear black hats with wings on either side; generals wear helmets with pheasants' tail feathers; soldiers wear ordinary hats, and kings wear crowns. Queens or princesses have jeweled helmets. If a hat or helmet is removed, this indicates the character is exhausted, frustrated, or ready to surrender. Hairstyles can express a character's emotions: warriors express their sadness at losing a battle by swinging their ponytails. For the female roles, buns indicated a maiden, while a married woman has a 'dai tau' (低頭). In the Three Kingdoms legends, Zhao Yun and especially Lü Bu are very frequently depicted wearing helmets with pheasants' tail feathers; this originates with Cantonese opera, not with the military costumes of their era, although it's a convention that was in place by the Qing Dynasty or earlier. Commentators draw an essential distinction between sung and spoken text, although the boundary is a troublesome one. Speech-types are of a wide variety: one is nearly identical to standard conversational Cantonese, while another is a very smooth and refined delivery of a passage of poetry; some have one form or another of instrumental accompaniment while others have none; and some serve fairly specific functions, while others are more widely adaptable to variety of dramatic needs. Cantonese opera uses Mandarin or Guān Huà (Cantonese: Gun1 Waa6/2) when actors are involved with government, monarchy, or military. It also obscures words that are taboo or profane from the audience. The actor may choose to speak any dialect of Mandarin, but the ancient Zhōngzhōu (Chinese: 中州; Jyutping: Zung1 Zau1) variant is mainly used in Cantonese opera. Zhōngzhōu is located in the modern-day Henan province where it is considered the "cradle of Chinese civilization" and near the Yellow River. Guān Huà retains many of the initial sounds of many modern Mandarin dialects, but uses initials and codas from Middle Chinese. For example, the words 張 and 將 are both pronounced as /tsœːŋ˥˥/ (Jyutping: zœng1) in Modern Cantonese, but will respectively be spoken as /tʂɑŋ˥˥/ (pinyin: zhāng) and /tɕiɑŋ˥˥/ (pinyin: jiāng) in operatic Guān Huà. Furthermore, the word 金 is pronounced as /kɐm˥˥/ (Jyutping: gam1) in modern Cantonese and /tɕin˥˥/ (pinyin: jīn) in standard Mandarin, but operatic Guān Huà will use /kim˥˥/ (pinyin: gīm). However, actors tend to use Cantonese sounds when speaking Mandarin. For instance, the command for "to leave" is 下去 and is articulated as /saː˨˨ tsʰɵy˧˧/ in operatic Guān Huà compared to /haː˨˨ hɵy˧˧ / (Jyutping: haa6 heoi3) in modern Cantonese and /ɕi̯ɑ˥˩ tɕʰy˩/ (pinyin: xià qu) in standard Mandarin. There are actually two female singers with Yam Kim Fai and Bak Sheut Sin in this sample. Yam Kim Fai is using her trademark indistinguishable male voice behind the Cantonese opera disguise. Only traditional Chinese instruments are used. Cantonese opera pieces are classified either as "theatrical" or "singing stage" (歌壇). The theatrical style of music is further classified into western music (西樂) and Chinese music (中樂). While the "singing stage" style is always Western music, the theatrical style can be Chinese or western music. The "four great male vocals" (四大平喉) were all actresses and notable exponents of the "singing stage" style in the early 20th century. The western music in Cantonese opera is accompanied by strings, woodwinds, brass plus electrified instruments. Lyrics are written to fit the play's melodies, although one song can contain multiple melodies, performers being able to add their own elements. Whether a song is well performed depends on the performers' own emotional involvement and ability. Cantonese instrumental music was called ching yam before the People's Republic was established in 1949. Cantonese instrumental tunes have been used in Cantonese opera, either as incidental instrumental music or as fixed tunes to which new texts were composed, since the 1930s. The use of instruments in Cantonese opera is influenced by both western and eastern cultures. The reason for this is that Canton was one of the earliest places in China to establish trade relationships with the western civilizations. In addition, Hong Kong was under heavy western influence when it was a British colony. These factors contributed to the observed western elements in Cantonese opera. For instance, the use of erhu (two string bowed fiddle), saxophones, guitars and the congas have demonstrated how diversified the musical instruments in Cantonese operas are. The musical instruments are mainly divided into melodic and percussive types. Traditional musical instruments used in Cantonese opera include wind, strings and percussion. The winds and strings encompass erhu, gaohu, yehu, yangqin, pipa, dizi, and houguan, while the percussion comprises many different drums and cymbals. 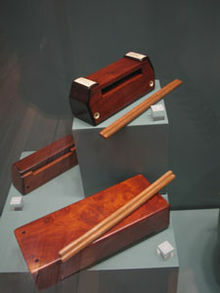 The percussion controls the overall rhythm and pace of the music, while the gaohu leads the orchestra. A more martial style features the use of the suona. The instrumental ensemble of Cantonese opera is composed of two sections: the melody section and the percussion section. The percussion section has its own vast body of musical materials, generally called lo gu dim (鑼鼓點) or simply lo gu (鑼鼓). These 'percussion patterns' serve a variety of specific functions. To see the pictures and listen to the sounds of the instruments, visit page 1 and page 2. These are attached to the helmet in mou (武) plays, and are used to express the character's skills and expressions. They are worn by both male and female characters. These are long flowing sleeves that can be flicked and waved like water, used to facilitate emotive gestures and expressive effects by both males and females in man (文) plays. Hand and finger movements reflect the music as well as the action of the play. Females hold their hands in the elegant "lotus" form (荷花手; Cantonese: Ho4 Faa1 Sau2). A basic feature of Cantonese opera, the walking movement is one of the most difficult to master. Females take very small steps and lift the body to give a detached feel. Male actors take larger steps, which implies travelling great distances. The actors glide across the stage while the upper body is not moving. These are black boots with high white soles worn by males, which can impede walking. This is a movement in which two performers move in a cross-over fashion to opposite sides of the stage. In this movement, two performers walk in a circle facing each other and then go back to their original positions. These are the basic movements of the hands and arms. This is the MOST important basic movement in ALL Chinese Operas. ALL other movements and skills are based on this form. This is a gliding effect used in walking. Most common in mou (武) plays, the actor stamps before walking. A circular swinging of the ponytail, expressing extreme sadness and frustration. A flower-shaped decoration worn on the chest. A red flower on the male signifies that he is engaged. Performers swing a whip and walk to imitate riding a horse. Literally, master, this is a formal term, contrary to mentor, for experienced performers and teachers, from whom their own apprentices, other students and young performers learn and follow as disciples. ^ 許, 國惠 (2016). "1950-1960年代香港左派對新中國戲曲電影的推廣". 南京大學學報（哲學·人文科學·社會科學）. 53 (2): 137–149. ^ "戲台上下—香港戲院與粵劇" (PDF). Hong Kong Heritage Museum Leisure And Cultural Services Department. Retrieved 25 February 2019. ^ "立法會十九題：粵劇的承傳及發展". 政府新聞網. 21 October 2009. Retrieved 5 March 2019. ^ 宋, 钻友 (1994). "粤剧在旧上海的演出" (01): 64–70. ^ Zhong, Zhe Ping (2014). "旧上海,粤剧夜夜笙歌之地". 南国红豆. 06: 51–53 – via HSU Database. ^ Cheng, Mei Po (2007). "The Trans-locality of Local Cultures in Modem China: Cantonese Opera, Music, and Songs in Shanghai, 1920s-1930s". China Agricultural University. 2007: 1–17 – via HSU Library Database. ^ "More on Cantonese Opera". ^ Li, Wan Xia (2014). "清代粵港澳神功戲演出及其場所". 戲曲品味. 159: 77–79 – via HSU Library Database. ^ a b "Lam Kar Sing". Virtuosity and Innovation – The Masterful Legacy of Lam Kar Sing 20 July 2011 – 14 May 2012. ^ a b "Ng Kwun-Lai". A Synthesis of Lyrical Excellence and Martial Agility – The Stage Art of Ng Kwan Lai 22 December 2004 – 15 September 2005. ^ Yam Kim Fai 有"女桂名揚"之稱的任劍輝 is one of the more famous exponent of Kwai Ming Yeung style of acting and vocal (腔). Movie The Red Robe(1965) demonstrates ‘masculine’ traits of Yam style(任腔). ^ Credited as Li Po-ying, Operatic revival, The Straits Times, 3 July 1982, Page 4. ^ CANTONESE OPERA YOUNG TALENT SHOWCASE – Artists Only about 15 in male costumes are lead actors. Actresses dominate as a result of the Yam-Loong Effect for over five decades. Both Koi Ming Fai and Lau Wai Ming were not old enough to be in the audience for Yam's final performance on stage in 1969. ^ Chan, Sau Y. (March 2005). "Performance Context as a Molding Force: Photographic Documentation of Cantonese Opera in Hong Kong". Visual Anthropology. 18 (2–3): 167–198. doi:10.1080/08949460590914840. ISSN 0894-9468. ^ "香港戲棚文化". HOKK fabrica. 29 June 2014. Retrieved 7 March 2019. Wikimedia Commons has media related to Cantonese opera.